Chaise longue. Most people know the meaning of this phrase, but not the proper spelling or pronunciation. Look at the second word closely; it's not "lounge", it's "longue", and sounds like the word "long". Some dictionaries now include an entry for "chaise lounge", since we in America often twist things around a little bit and eventually the dictionary people give up and let us have it our way. But I'm sure the French would scoff at us for what we have done to their words. What would they have to say about Barbette, I wonder. Other reviewers have made the assertion that walking into Barbette is just like walking into a cafe in Paris, but my sources (Jimmy and Judy), tell me it's really nothing like that at all. I don't know if Barbette's intention is pure authenticity or not, but I don't think it matters all that much because what they've got is really damn good in its own right. The breakfast menu includes a selection of omelettes, quiche, waffles, crepes, and such, as well as a few versions of Eggs Benedict and things like granola, yogurt, or croissants. One distinction we noticed right away - they only offer one kind of potato (pommes frites, or french fries), and you must order it separately if you want it. We got a half-order and shared it as an appetizer, and that was plenty for the five of us who were sampling it. A whole order is huge (super-size, we might say), so be warned that you should only order the pommes frites if you plan on sharing with a friend or two. The standard accompaniment to eggs in place of potatoes is a salad of lightly-dressed field greens, which makes the meal quite a bit lighter and an option we wish more restaurants would offer. Rachael, Jimmy, and I all got the traditional Eggs Benedict and we all liked it. The hollandaise sauce is quite good and they know how much is enough. Judy got the daily quiche which included red peppers, leeks, and asiago, and said it was "the best quiche she had ever had", though we all knew she was hyperbolizing, and she knew we knew. Alex got an omelette with brie and fines herbes, which she liked although couldn't finish. And finally, Beau got the french toast, and emphatically told us to never allow him to get french toast anywhere else because this was the best - eggy, delicious, and served with plenty of real maple syrup. The only loss of points came as the result of an unfortunate coffee-free period near the beginning of the meal, but that was only a minor complaint. So, incroyable!, the breakfast club was happy for the third week in a row. Barbette, our French (or French-inspired) cafe spoke to us in language we all understood... quality breakfast food. It's true that the breakfast club was happy for the third week in a row, but that is only because the partial club meeting on Saturday at the Small Cafe with the Ironic Name did not officially count as a breakfast club meeting, and we tried again on Sunday. I will not mention that fiasco on these pages again. I agree with everything Fern said here, except that I wasn't crazy about my food, because I wanted something else in my omelet like a tomato or spinach. It was a little bit boring with just the brie and the herbes. Aside from my own ordering mistake, I believe Barbette is an old standard for a very good reason. Anyone reading the paper this morning or listening to MPR last night has already heard that on the very day we ate at Barbette, many diners took ill with food poisoning. Thankfully, we were not among them. (I can also say that if the cluprit really is chilled carrot soup, I run absolutely no risk of ever eating that particular tainted food. Blech.) Anyway, they reopened today with an extra-clean kitchen. 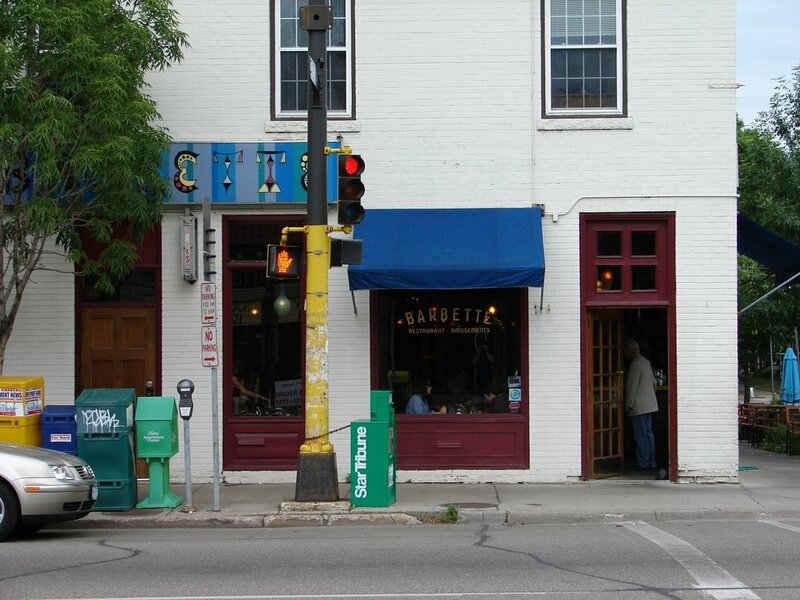 I hope they don't lose too much business, because it ain't easy finding a place all six of us will go, and Barbette has been a consistent crowd pleaser for about six months.